The planning applications for the Haboakus developments in Northway have finally gone online on the Council’s website, though they seem to have bypassed the Planning Search system. I haven’t had time to look at them in any detail yet, but for now here are the links. This seems to have changed its alias from Dora Carr Close to Maltfield Road. Reference: 12/03280/FUL. I’ll post more in a few days’ time. Developers Haboakus have finally submitted planning applications for three developments in Oxford. Two of the them are in Northway, the third in Cowley. The applications were submitted at least a week ago (week beginning 31 December or before) but as I write this they still haven’t appeared online. Haboakus is a joint venture. The ‘Hab’ part is TV celebrity architect Kevin McCloud’s company. Hab stands for Happiness, Architecture, Beauty. Oakus is a trading name of housing asociation GreenSquare, which incorporates what used to be the Oxford Citizens’ Housing Association. OCHAs, presumably pronounced Oakus. Neat, eh? The developers say that most of the accommodation will be affordable housing for rent or shared ownership, with a small proportion for sale on the open market. 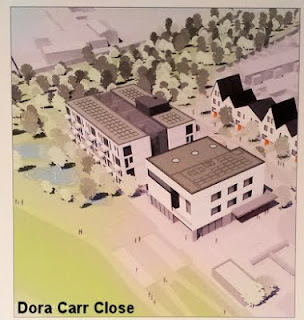 These developments have been much delayed: I first wrote about them in Headington Headlines #3 back in March 2011. I learned that the final proposals were on show at GreenSquare’s offices in Cowley so I went to have a look. I was disappointed, but perhaps not surprised, to find the display consisted of only two small boards on the wall in Reception. There were no plans or technical drawings, only a few rather sketchy artist’s impressions. For what it’s worth I’ve copied the text relating to the two Northway sites. The [project] sits on the corner of Westlands Drive and Sutton Road, next to the Northway Evangelical Church and Plowman Tower. The proposed building is a three-storey mansion block containg 21 one- and two-bedroom flats. The block is in fact two blocks split on either side of a central ‘winter garden’ which allows more daylight and cross-ventilation to all homes and creates opportunities for residents to meet and chat. 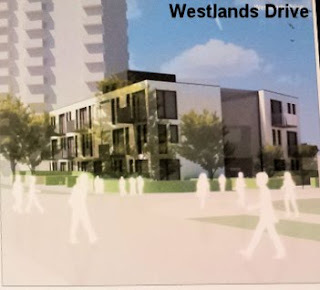 [The development] will provide 47 new homes including 15 three-bedroom houses, 4 four-bedroom houses and a four-storey mansion block containing 28 one- and two-bedroom flats. As at Westlands Drive the mansion block has an enclosed winter garden running down its centre. The proposal also provides new state-of-the-art community facilities including a mulit-use hall with improved sports changing rooms, social and café areas, local business units, education and learning space and outdoor areas for growing food. This new venue will have the capacity to host social occasions such as weddings, conferences and sports events. These are the best pictures I could get of the drawings. There should be better ones once the planning application goes public. You can see the location of the two sites on this map. It’s a bit early to get any real idea what these developments will look like and what impact they will have on the local area. An Oxford Mail report suggested there may still be local opposition. Purely as a first reaction I rather like the idea of the ‘winter garden’ (I would call it an atrium) to bring light and air into the ‘mansion blocks’ (or ‘blocks of flats’). The idea of residents meeting and chatting is the kind of worthy idealism we might expect from Kevin McCloud. It will be great if it happens, but it remains to be seen how realistic it turns out to be. Apparently the City Council say it takes a long time to get ‘big developments like this’ into the online planning enquiry system. I hope that doesn’t mean the time comes out of the statutory consultation period, but I fear it might. If you know please leave a comment!